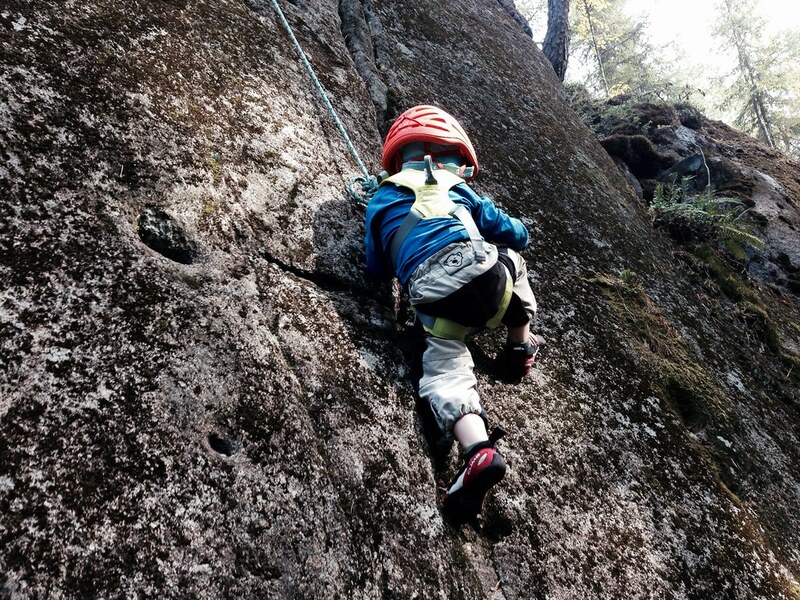 Climbing is fun, and it’s even more fun to have your children along. In this article I share some thoughts on climbing with litte kids & highlight some kids climbing gear that has worked well for us. Our son always has climbed: First on chairs and the sofa, up stairs and even on top of the table when no-one was looking. Taking him along to the climbing gym and outside bouldering and rock climbing, he quickly also wanted to climb like dad. As normal shoes are fairly inadequate for climbing and I want to encourage him to climb & have fun, I did quite a bit on research on kids climbing gear: Interviewing friends who go climbing with their little ones, comparing at online shops and reading the handful of reviews on blogs. 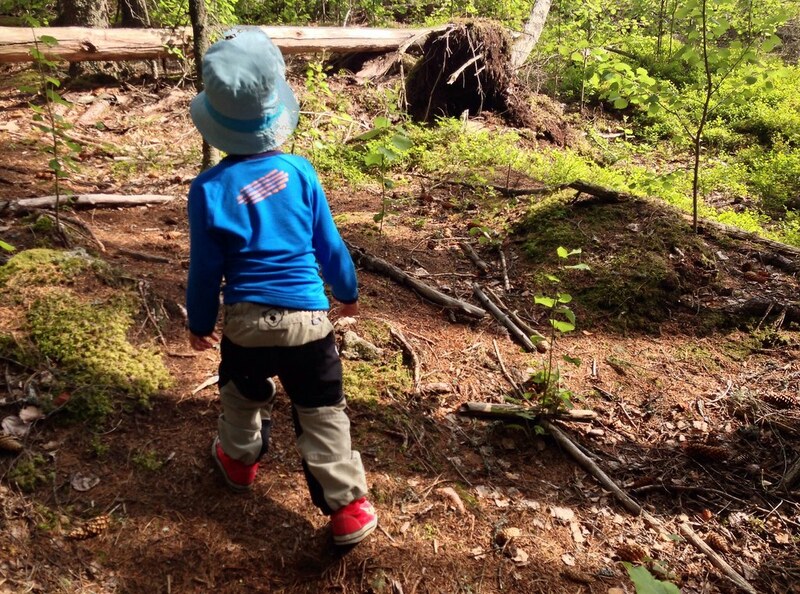 So that you have an easier time picking good gear for your little one to come along and climb safely & have fun, here’s our gear recommendations. As children grow fast almost all kids climbing shoes are available in adjustable sizes. It hurts in the wallet if you need to buy a new pair each four to six months and at a regular price of around 50€ climbing shoes for kids ain’t cheap. 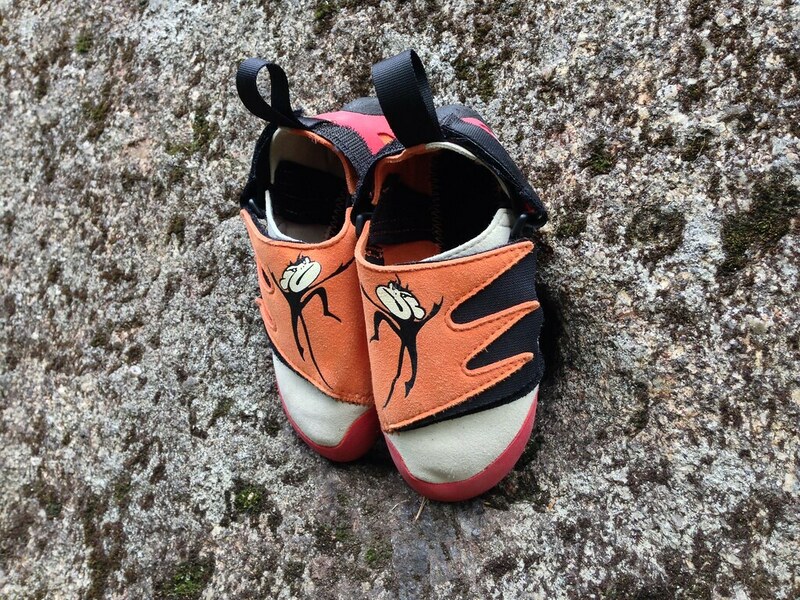 We bought the Climb X Monkey in EU Size 29 (16 cm inside length). The Monkey print on them is a nice touch for kids, and parents will appreciate the large Velcro closure which makes it super easy to put on. In the heel there is a 2nd Velcro strap which lets you adjust the size. It has a flat, grippy rubber sole, a rubber toe bumper and the rubber goes up in the heel, too - ideal for heel hooks. The toe box is wide if I compare them to my shoes so you won’t damage your kids feet. The rubber sole is thick but still lets the little ones climb very precise - I’m often surprised by how well he can stand on narrow ledges with the shoes. I usually buy his shoes a number larger and adjust the size then via the Velcro strap, that way we get more usage out of them. As it’s now summer sale in most shops it’s a good decision to check out what they have on offer - at least at Bergfreunde all kids climbing shoes are almost 15 or more % reduced in price right now, so a good opportunity to pick up a pair. If you only go bouldering then a pair of shoes is pretty much all you’ll need for the start, but if you also do a lot of rock climbing you also might want to pick up a kids harness. 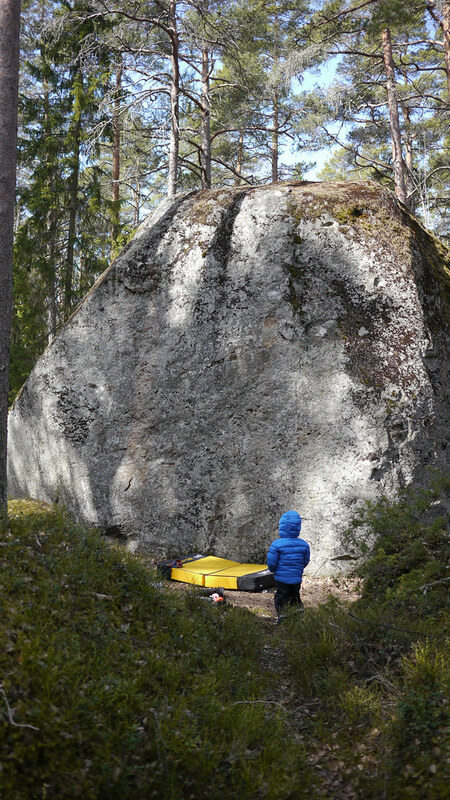 Our son started climbing before he was two years old and since then has been climbing indoors & outdoors and often comes along bouldering with me. As I really like rock climbing I decided to buy him a Kids harness so he can come along to the gym and crag once and a while. After some research I quickly settled on the Edelrid Fraggle - it’s a full-body harness, affordable and easy to use. We use the XXS Size since January 2014 and I expect we’ll get another year or one and half out of this harness. The XXS size goes from a Torso length of 50 to 70 cm and the leg loops go till 37 cm in diameter and can carry a child up to 40 kg. The Edelrid Fraggle is easy to put on: Two leg loops and two arm loops with two buckles to adjust the size - one in the front, one on the backside. A Buckle closes the harness below the tie-in loop. 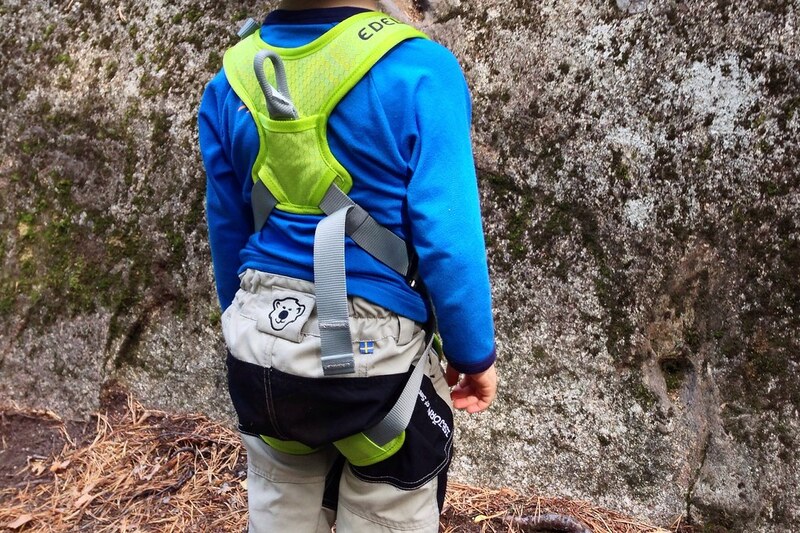 It’s padded & comfy and my son wears it often the whole time we’re at the crag until we go home. What’s special about it is that in the back it has a 2nd loop, which is ideal for kids that already can climb on their own but are too light and tend to get stuck when you lower them. In this back loop you can tie in a 2nd rope, wicht which you can gently pull the child down when it is stuck again. If your child is already a bit older and can already sit upright in a harness by itself then a normal harness like the Edelrid Finn would be a good solution. For more safety you can add the Edelrid Kermit Chest Harness which is compatible with any (normal) harness. There are dedicated kids climbing helmets, like the Petzl Picchu. While safety is of the utmost importance for us if we go climbing with our son we thus far have used my Petzl Sirocco for my son as with a thin beanie underneath it can be cinched down to a good fit for him. When he will be older & we’ll be more regularly rock climbing he will get his own helmet (maybe the new Edelrid Kids helmet) but for now we use the Sirocco. If you’re child already has a bicycle helmet, that’d be an option that could work in a pinch, too. Clothes for climbing should be durable and give freedom of movement. It’s astounding how fast kids learn just by seeing what mom and dad do: We once were bouldering and I heel hooked, and the next time it was my sons turn to climb he started to also heel hook - without me having told him so! It’s a case of monkey see, monkey do =) So pants and shirts should not inhibite movement and should be robust: The little ones will often lean against the rock to take a break or slide down on it, so unless you want to buy new clothes after each climbing trip it’s well worth it to buy durable garments that have reinforcements in the seat and knees. We like Isbjörn of Sweden and so does our son, too. The Trapper Pant Cordura has the afore-mentined reinfocements in the knee and seat area, made of Cordura these pants take any abuse my son throws at them. To keep mosquitos and UV rays at bay he wears the very cool MOUNTAIN Longsleeve which has a topographic print of the Kebnekaise on it. Made from Tencel it’s soft on the skin and his favourite piece to wear when we go outdoors. If there’s a chance of rain then the Light Weight Jacket comes into the backpack. Made from a wind- and waterproof fabric with a high collar and removable hood, it’s a nice jacket that keeps him dry & warm in bad weather. Finally, to keep the ears warm and make the helmet fit better we have the soft merino wool Isbjörn Beanie along. The last time we were at the crag I walked up to the top of the cliff with my son and we wanted to try to rappel down, so he can see how to “walk down”. We were almost over the lip as I realized that he didn’t seem to like it, so we made the two steps back up to the cliff and saved the rappel experience for another time. I think as a parent it is important in these situations to be a) Aware if the little one is doing fine and b) If one’s owns plans are feasible & safe. If either of these questions is answered with “No” it’s a smart solution to just walk back down. Here’s the small print: Climbing is dangerous and as a responsible adult you should know what you’re doing. Don’t do dangerous stuff when the health of your child is at risk, don’t force them to do things, and most of all, have fun. You’re a hero for them already, no matter if you manage to top out or not. Be wise & be a good example.